Pete Ross needs money, and can't help but imagine what it'd be like to be able to live the good life... a mindset that leads him to one of his inevitable Luthor rants at the Talon. It's only exacerbated when Chloe fills Clark, Pete, and Lana in on Camp Charity (later Camp Freedom), a new venture by Lex Luthor to give underprivileged kids some summer fun in the great outdoors. Needing volunteers to help her (it's an assignment from the Daily Planet, where she's interning, for you continuity lovers), she ropes the gang in. At the camp, Clark and Pete soon meet an up and coming basketball player named Will Perkins, a young man obsessed only with the almighty dollar, present to help with the camp only to fulfill a public service requirement before he can hit the big time. They also meet DeJuan Williams, a young and relatively withdrawn camper. It isn't long before Pete realizes how good he has it, compared to the kids, and changes his dream to instead be Robin Hood, stealing from the rich and giving to the poor. And his plan? Challenge Will to a basketball game: Smallville vs. Metropolis, with the loser forking over $10,000. Pete begs Clark to help and refuses to take no for an answer. Clark is understandably reluctant. When DeJuan begins to drown in the camp lake, Clark swims to the rescue, only to discover meteor rocks at the bottom. Both barely surviving, the aftermath is both obvious and inevitable: DeJuan's developed the ability to see into the future, and Clark wants to help the boy cope with his ability. Story - 1: Do you know the feeling? That one you get when you're expecting a big exciting package, but when the doorbell rings, it's not the postman, but a flaming bag of dog poo? 1: Pete's behavior in this story is completely out of character. Pete would NEVER intentionally put Clark into a situation where his powers could come out, and certainly not for some stupid bet. 2: Pete would never bet a ton of money that he couldn't back up. That's just common sense. And doing so just because he knows someone with powers is doubly foolish, because it puts Clark into a situation that a true friend would never subject another person to. Here, Pete does it TWICE. 3: Will's a completely one note character... He possesses no depth. He's literally all surface, and NO ONE is like that in the real world. 4: Clark CHEATS for MONEY. That's just all KINDS of wrong right there. 5: DeJuan's powers fade when away from the camp. Bu-WHA?! KRYPTONITE POWERS DON'T WORK THAT WAY! WE'VE SEEN IT A HUNDRED TIMES ON THE SHOW! THEY DON'T GO AWAY JUST BECAUSE THEY'RE NOT NEAR THE RADIATION! It's an idiotic way to resolve the conflict, and proof that the "writers" (and I use that term loosely) wrote themselves into a corner. 7: No one learns anything. Pete begins by ranting about how the rich give what's, for them, a paltry sum of money to charity... and it ends the same way... AFTER Lex saves his keister in the aftermath of the second game. No gratitude or new understanding... It makes Pete come out to be a total jerk. By the same token, Clark learns that cheating is bad. Except he knew that to begin with. Of course, he did it again later on the TV show by playing football... So no lesson learned. To summarize: Out of character behavior, stupid plot contrivances abound, flat villain, and Pete's a d*****bag. Somebody get the garden hose. I need to stomp this flame out, and these are new shoes I'm wearing. This novel is a total failure on every conceivable level. An utter disaster. I paid a buck for it... I was overcharged. Cover Art - 1: The standard promotional shots taken from episodes. The front doesn't even have the decency to have Pete on it... He's relegated to a tiny picture on the back. 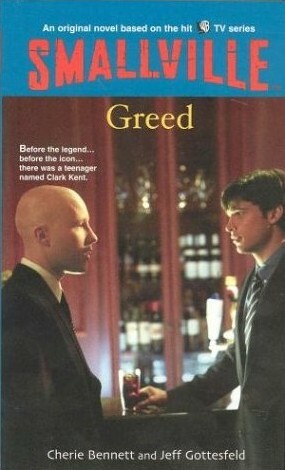 Instead, the cover image is Clark, in a suit, talking to Lex. Except that, y'know, they're wearing CAMPING GEAR IN THE STORY, NOT BUSINESS SUITS! BAKA! (smacks the person that picked that picture). The failure of this cover to convey the contents is entirely appropriate, considering the utter failure of this book in general. Superman Returns: Earthquake in Metropolis! Superman Returns: I am Superman! Superman Returns: Be A Hero! Superman Returns: Thank You, Superman!